How do I move outcomes and outcome groups in a course? 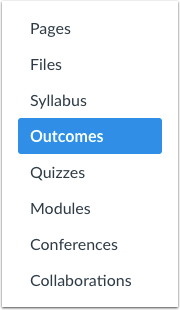 You can move outcomes and outcome groups in your course outcomes. You can use the Move Outcome or Move Outcome Group button, or you can manually drag and drop the outcome or outcome group. Note: To move an outcome to an outcome group, you will need to create an outcome group. Locate the outcome or outcome group you wish to move. To move an individual outcome or outcome group, click the Move button. Select the outcomes group where you want to move the outcome or outcome group . Click the Move button . You can also use the drag and drop option to move outcomes and outcome groups. Click the outcome or outcome group and drag the outcome or outcome group to the desired location. Drop the outcome or outcome group in the desired location by releasing the mouse. Previous Topic:How do I create custom course outcome names for students? Next Topic:How do I find an existing outcome to add to a course? Table of Contents > Outcomes > How do I move outcomes and outcome groups in a course?